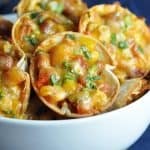 These bite-sized Mexican appetizers made in your muffin tin are super easy, cheesy, and completely delicious! Perfect for lunch or game day! Preheat oven to 425 degrees. Lightly coat 2, 12-cup muffin tins with non-stick cooking spray. In a medium skillet, heat the beans, corn, and salsa over medium-high until warmed through. Remove from heat and stir in the tomatoes. Season with salt and pepper to taste. Set aside. Place tortillas on a cutting board; using a 3-inch cookie cutter or the bottom of an empty 15 ounce can, press firmly enough in a rocking motion to cut through the tortillas. (You should get 4 circles per tortilla, for a total of 24.) With your fingers, press a tortilla circle into each muffin tin (it should be snug.) Fill each tortilla with a heaping tablespoon of the bean mixture, sprinkled with a little cheese and scallions. Bake for 10 minutes, until tortillas are crispy and cheese has melted. Wait a minute and then remove from the cups with a small spatula or fork. Serve immediately.